Carol Purnell moved to Selsey with her partner Mike from the Heathrow area in 2001. She worked in IT Management in the UK, Germany, Italy and the USA until she took early retirement. 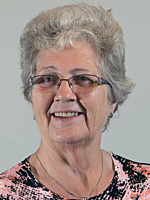 Carol has been a member of Selsey Town Council since 2007 and of Chichester District Council since 2011. At Chichester District Council Carol held the position of Cabinet Member for Planning and Housing from May 2013 to May 2015, and then Cabinet Member for Housing and Environment from May 2016 to May 2017. Carol is an Adviser to the Cabinet Member for Safer, Stronger Communities on Fire and Rescue.